Artwork of a Bonus Barrel from Donkey Kong Country 2: Diddy's Kong Quest. Transports the player to a Bonus Area. A Bonus Barrel is a recurring Barrel that takes the Kongs to a Bonus Level. It first appears in Donkey Kong Country 2: Diddy's Kong Quest as a replacement for the Auto-Fire Barrels from Donkey Kong Country that carry the Kongs up into a Bonus Level. Bonus Barrels have since appeared in many Donkey Kong titles. In most of their appearances, Bonus Barrels are identifiable from their large B symbol in the center, on a yellow explosion with a red border, and an opening on top. In Donkey Kong Country 2: Diddy's Kong Quest, its sequel Donkey Kong Country 3: Dixie Kong's Double Trouble! and their respective Game Boy counterparts, Donkey Kong Land 2 and Donkey Kong Land III, there is usually at least one Bonus Barrel hidden in almost every level. Bonus Barrels have the same function as the Auto-Fire Barrels taking the Kongs to a Bonus Area in both Donkey Kong Country and Donkey Kong Land. When the Kongs jump into a Bonus Barrel, it automatically launches or warps them to a Bonus Area (the former effect is the only one in Donkey Kong Country 2: Diddy's Kong Quest, and the latter, which has the explosive 'B' design fade out in a swirl-type effect, is the only one in the Game Boy Advance ports for the Donkey Kong Country games). In the Bonus Level, the Kongs can complete a challenge to win either a Kremkoin or a Bonus Coin, which are necessary for unlocking levels of a lost world and adding to completion percentage. If the Kongs lose the challenge, they are redirected back into a specific point of the main level; usually they are able to re-enter the Bonus Barrel and reattempt the challenge. Bonus Barrels also appear in the Game Boy Advance port of Donkey Kong Country, as a replacement for the Auto-Fire Barrels carrying Donkey Kong and Diddy Kong to a Bonus Level. The player can add to their completion score by simply entering a Bonus Barrel, more specifically the Bonus Area, in all three versions of the game. Bonus Barrels do not appear in Donkey Kong Country Returns and Donkey Kong Country: Tropical Freeze, as Blast Barrels once again launch the Kongs to Bonus Areas, while other Bonus Areas are accessed by entering into secret passages. 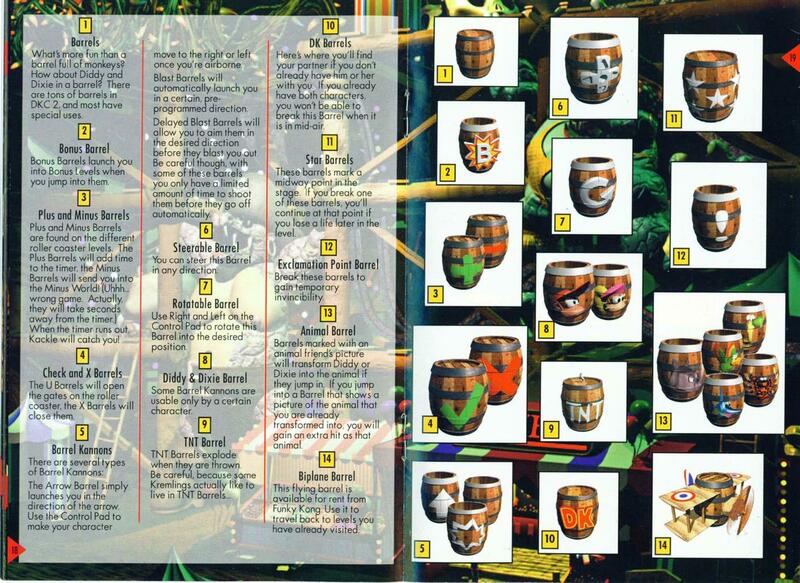 In Donkey Kong 64, the design for Bonus Barrels was altered to show its prize, a Golden Banana instead. It no longer has an opening appearing on the top. When the active Kong approaches a Bonus Barrel, purple sparkles appear around it. When the Kong jumps into a Bonus Barrel, it rapidly shrinks, and the Kong is warped into a Bonus Stage. By completing the challenge, the Kong is sent out of the Bonus Barrel, which shakes and breaks open, revealing a Golden Banana. In Hideout Helm, there are five rooms connected to the main room with the Blast-o-Matic. Each room has two Bonus Barrels with a unique steel barrel-like design with King K. Rool's face. By completing each set of two challenges, the Kong is rewarded with a Banana Medal. The Training Barrels from the start of the game function similarly to Bonus Barrels. In DK: King of Swing, Bonus Barrels once again warp to a Bonus Level, which rewards a Crystal Coconut if Donkey Kong or Diddy complete the challenge. Bonus Barrels are also larger than in its previous game appearances. In DK: Jungle Climber, Bonus Barrels redirect the Kongs into the bonus game, Banana Bonanza. When they complete the mini-game, they are sent back into the level. In DK Country, one of 18-Volt's microgames from WarioWare: D.I.Y. Showcase, the player must tap a moving Bonus Barrel to shoot Diddy Kong into the air while avoiding a Zinger. Donkey Kong Country 2: Diddy's Kong Quest / Donkey Kong Country 3: Dixie Kong's Double Trouble! This page was last edited on April 10, 2019, at 21:23.